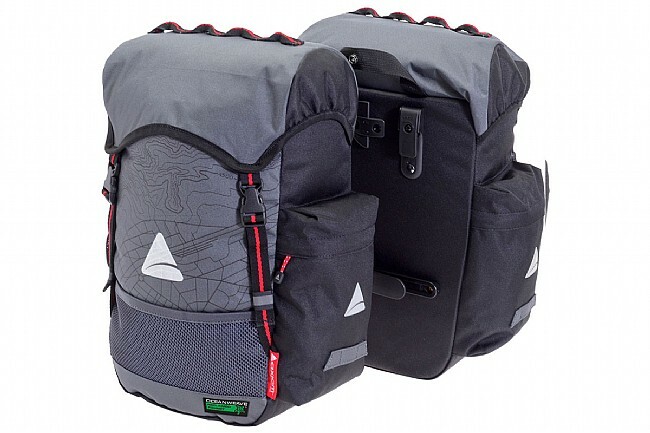 The Axiom Seymour Oceanweave Pannier Set is made from Oceanweave 600D polyester that's sourced from recycled fishnets for an incredibly durable construction that also helps clean up the environment. A waterproof polyurethane coating is added to the fabric for protection from the elements, and inside 35 L of storage is backed by a red interior liner that makes it easy to find objects hiding at the bottom. A drawstring closure under the lid comes in handy for oversize items, and organization is ample with mesh pockets and a zippered rear pocket. For additional accessories, daisy chain webbing at the top provides lash points for clothing, pouches, or other gear. Features stiff polyurethane backing plate, 3M reflective accents, and rear loop for attaching a tail light. Rixen & Kaul mounting mechanism is adjustable for rack tubing between 6 mm to 16 mm in diameter. 35 L capacity. Claimed weight is 1240 g / pair. I typically only use my bags for trips to the pool for swimming and commuting to work. Solid product with plenty of space to throw bike lightscomputerbottles in quickly when locking up. Water does bead up on the outside keeping items inside dry. Will definitely be using these for a two day bike-camping trip upcoming but probably too small for trips lasting much longer. I use these in San Diego for commuting, grocery shopping, and long day rides to carry extra clothing and food. The capacity is greater than I expected which is helpful when I've gone grocery shopping hungry. The attachment clips are easy to use and the packs stay in place well even when riding on uneven surfaces. The fabric seems very durable and will keep out a light to moderate rain. I'm not sure about using them in really wet climates though? Overall a great set. I'm thinking of getting another set for my daughter who commutes to work.